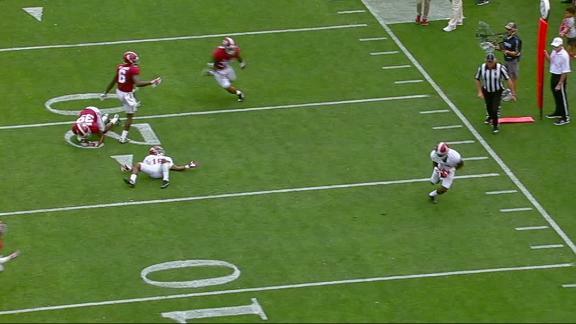 Tua Tagovailoa's pass is tipped in the air a few times, but it bounces the right way to Jerry Jeudy, who runs it in for the TD in Alabama's spring game. Recruiting reporter Derek Tyson joins ESPN's Phil Murphy to offer an inventory of committed SEC wide receiver prospects and project which uncommitted players might land there. What do Miami recruits think of Richt? Natioanl recruiting analyst Gerry Hamilton spoke with top Hurricanes' targets to gather their opinions on Mark Richt getting the Miami job. He joins ESPN's Phil Murphy to share the prospects' thoughts.